If UFO hunters are to be believed, Mars is one of our solar system's most bustling ecosystems, full of wildlife and ancient history. And a recent "discovery" made by a well-known alien enthusiast appears to support that theory. Paranormal Crucible shared a YouTube video on April 20 showing what appears to be a tall, textured object in a Martian landscape. "Intriguing object found by the curiosity rover, this time a possible tree stump," the caption read. "This object definitely looks out of place and in my opinion could be the petrified remnants of a Martian tree." "Object is around 3 feet in height, and with numerous discoveries of plant and animal life on mars, it would be logical to assume, that a variety of tree either existed, or still exists on this enigmatic planet," the description continued. Maybe the tree was part of the garden of the Martian king, whose "remains" were spotted by the same UFO hunter last year. Or perhaps, as many YouTube commenters have suggested, it's just a rock. The MRO has provided the most convincing evidence yet that small amounts of extremely salty liquid water may still flow on the surface of Mars. The orbiter found that some ice may melt as the red planet warms during particular seasons, allowing the liquid to run down hills, creating streaks on the Martian surface. The MRO has also kept an eye on other spacecraft that are exploring Mars from the surface. The orbiter has snapped photos of the Spirit, Opportunity and Curiosity rovers from its post above the planet. The MRO even caught sight of Curiosity as it descended to its landing spot via parachute. The MRO has also scouted out new landing sites for other missions to Mars. Most recently, scientists have used the spacecraft's data to map out possible landing targets for a human mission to Mars. The MRO has also treated scientists to views of relatively fresh craters on Mars. One crater -- which appeared in photos in 2010 -- was not in images taken in 2008, meaning that whatever impact created the crater happened in between those years. Thanks to data beamed back to Earth from the MRO, scientists now think that there might be a supervolcano lurking beneath the surface of a very old crater on Mars' surface. "On Mars, young volcanoes have a very distinctive appearance that allows us to identify them," scientist Joseph Michalski, said in a statement in 2013. "The longstanding question has been what ancient volcanoes on Mars look like. Perhaps they look like this one," he said. The MRO also captured an incredible image of a 12-mile-high dust devil swirling on the red planet in 2012. While the Martian atmosphere is thinner than Earth's, wind can still whip up dust storms and dust devils on the planet, according to NASA. The MRO has also snapped photos of fields of sand dunes on Mars, which change shape according to which way the wind blows from season to season. At the moment, the Curiosity rover is exploring some of these martian sand dunes for the first time, investigating the sand of the red planet from close range. One particularly incredible photo taken in August 2015 shows an avalanche of frost falling off a scarp. The orbiter managed to catch the avalanche at the exact moment the frost was falling. The MRO doesn't only have eyes for Mars. The spacecraft has also taken some stunning photos of the red planet's moons, Phobos and Deimos, giving people on Earth a sense of the strange color of the oddly shaped moons. After 10 years in orbit, the MRO has definitely seen some weird stuff on the world's surface. One of those strange sights was the path left by an oddly shaped boulder rolling down a slope. 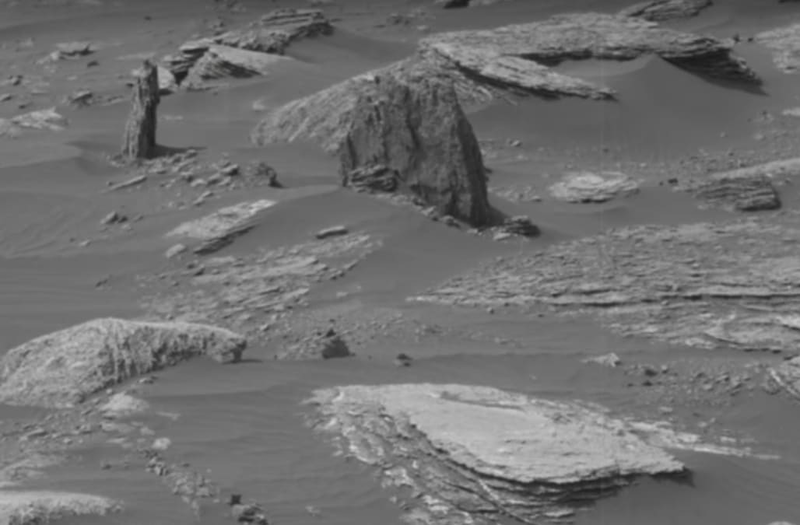 The MRO caught some images of the tumbling rock in 2014, even spotting the area where it landed upright. The MRO's imager also spotted gullies of frost on Martian plains, which look somewhat like the patterns deltas carve on the surface of Earth.